The first time seeing this Winter Wren (Troglodytes troglodytes) was when I birded with Iris Schumacher at Cochran Shoals Units of Chattahoochee River National Park, one of my favorite birding hot spots. 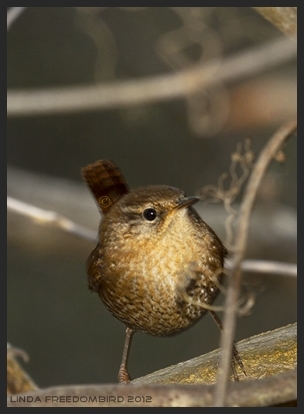 This tiny stubby wren with only about 4 inches in body length but is energetic in voice. Considering my morning alarm clock is Carolina Wren (5.5 in or 14 cm in body length), Winter Wren (4 in or 10 cm in body length) is not shy to " speak out". Their amazing high-pitched thrills (click this link to hear some of their songs) will make you slow down your steps. They like to stay low on ground and like to hide under bushes or leaves to stay out of sight. I snapped few shots of this wren near the river bank when I tried to take pictures of few Ruby-Crowned Kinglets.